I’m just a giant kid masquerading as an adult, so, naturally, Halloween is my favorite holiday. I love everything about it: pumpkin patches, corn mazes, scary movies, (pretty sure I’ve seen every single one ever made), caramel apples, jack-o-lanterns, dressing up, trick-or-treating, and, of course, candy (bring on the Snickers and the Nerds!). One of the best things about having a little kid now is that I can do all of that fun little-kid stuff without people thinking I’m a total weirdo. 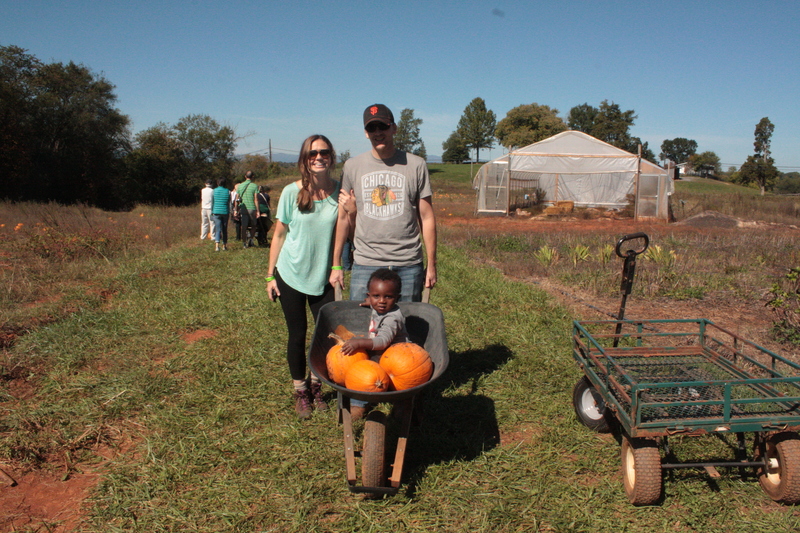 I could never drag my husband to a pumpkin patch when it was just him and I, but now he has no excuse. I wanted to go big this year, seeing as it was Miles’ first real Halloween. (He was so little last year that it didn’t really count.) So, I was excited to discover a farm called Liberty Mills, home to the biggest corn maze in Virginia. It’s on 25 acres (25!) and this year it had an Alice in Wonderland theme. There are actually four mazes of escalating difficulty, but we only made it through two–that backpack is heavier than it looks. 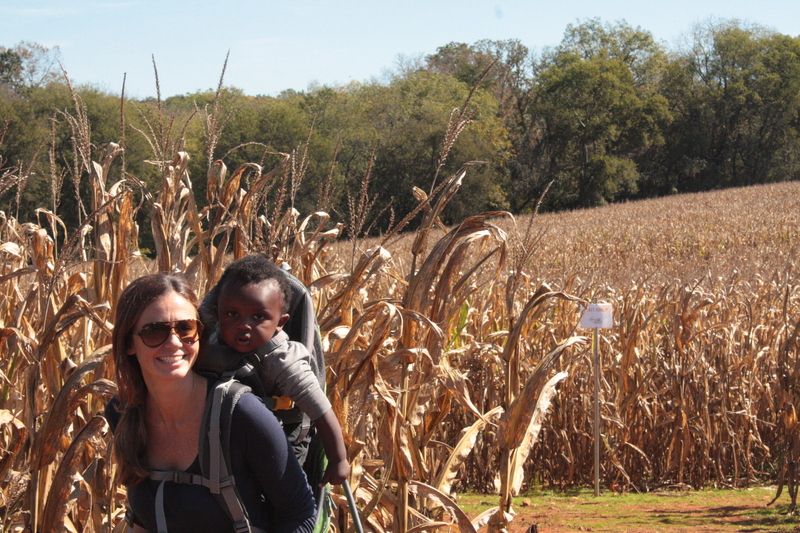 And Miles wasn’t quite ready to enjoy it as I had imagined he would… you know, running through the corn stalks with a huge smile on his face having the best time ever. Really, he just looked confused the entire time: Where the heck are we and what are we doing? But I still had fun! Jamie was much better at navigating the maze than I was. Miles would probably have been better at it than I was. I got us totally lost. And it started getting pretty hot in there without any shade. Good thing we had a map! 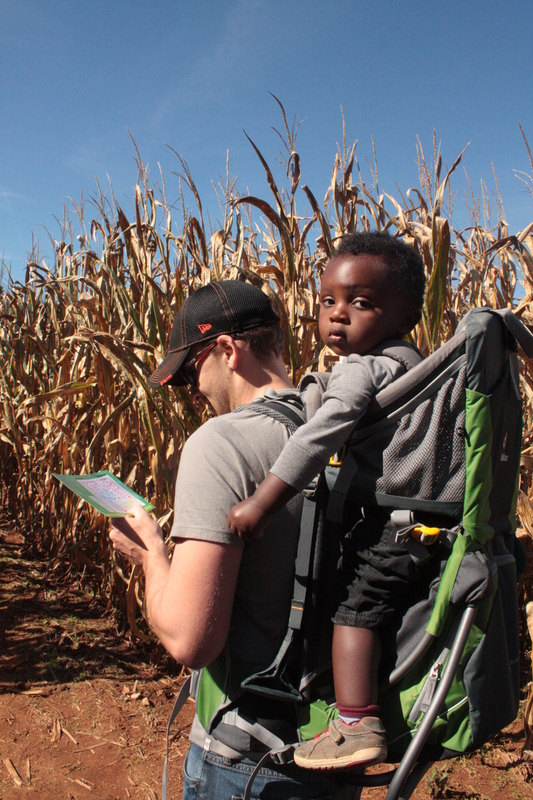 The mini corn maze for kids was more Miles’ speed. 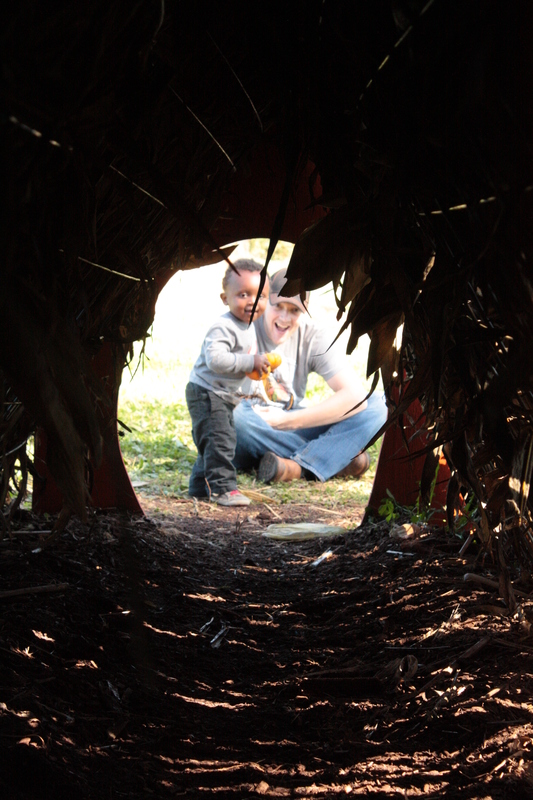 It was more of a corn tunnel, but he l-o-v-e-d it. 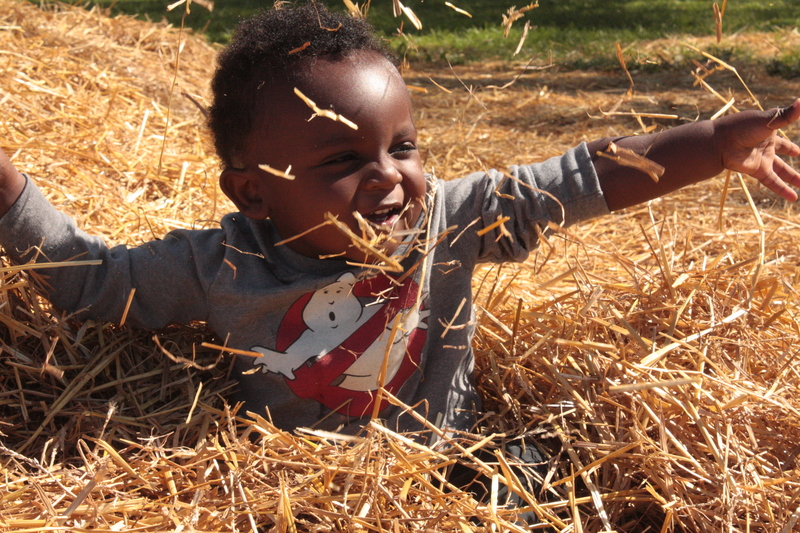 I think he may have loved playing in the huge pile of straw even more, though. 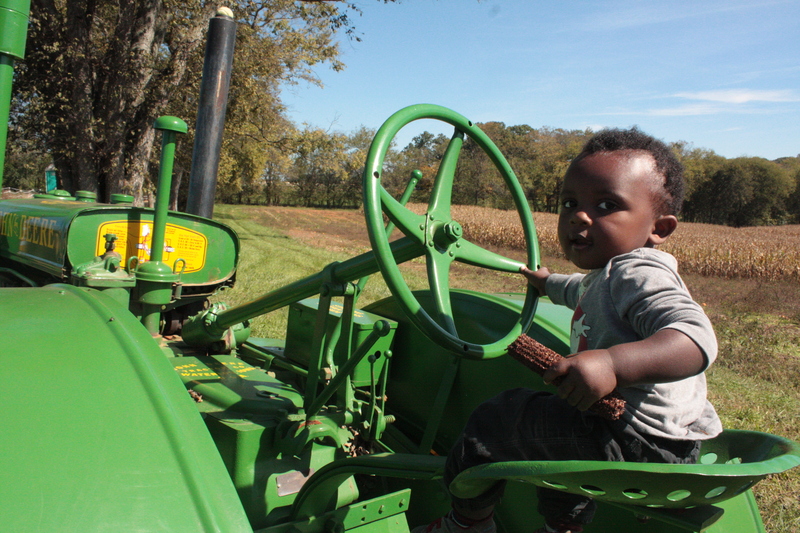 Driving the tractor was a huge hit, too. What a little farmer–ear of corn in one hand, steering wheel in the other. 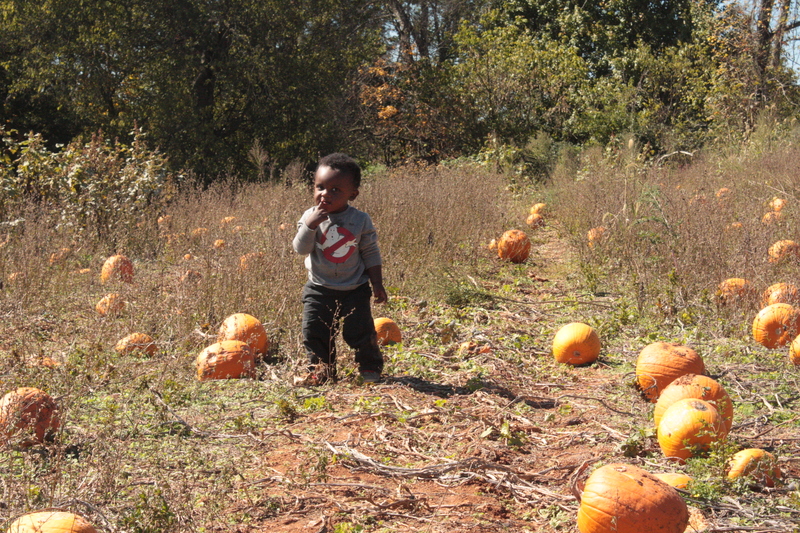 When it was time to pick our pumpkins, we had to stop and check out each and every one. Hmmm, which one shall I choose? Big decision! It took awhile, but we finally found three perfect ones. I know Miles will probably never remember this day, but I always will!